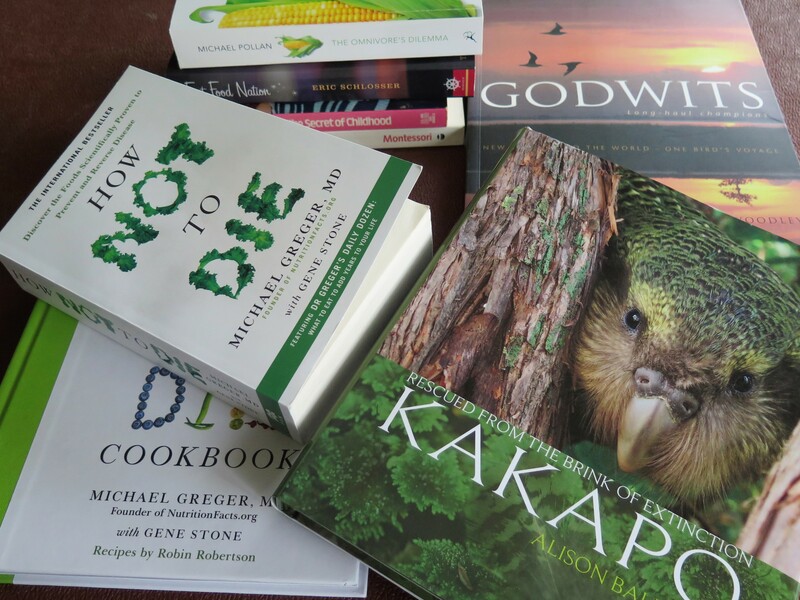 I’d like to share some of my favourite books in the areas of health and wellness, sustainable and ethical living, wildlife conservation, and family and education. These books have enlightened and inspired me to live a more considered life. I hope some of these books may help you in your life too. This book is packed with scientific research to back up discussion and anecdotes on how nutrition can prevent and treat modern and often preventable diseases, such as high blood pressure, heart disease, type 2 diabetes, liver and kidney diseases, brain diseases, suicidal depression and even cancer. Over the years, as I’ve learned more about the impact of eating too many animal products on human health, wildlife, the environment and animal welfare, I’ve made changes to eat a whole-food plant-based diet. Reading Greger’s book has provided scientific evidence to support what I’ve read about health benefits in general. If you only read one book this year, make it this one! Just looking at the white cover edged in lime green makes you feel inspired and healthier! Inside, there are plenty of easy recipes for breakfast, lunch, and dinner, as well as snack foods to satisfy those munchie moments. Greger gives advice on what to keep in your store cupboard, as well as his Daily Dozen foods to eat every day for good health naturally. There’s also a short introduction with a summary of how a plant-based diet can reverse the chronic diseases covered in How Not to Die. Where Louv’s first book rang the alarm bell, this book provides help. Research, anecdotes and personal stories show how connecting with nature can restore our health, build better businesses and create sustainable lifestyles. While this collection of practitioner experiences and insights is aimed at healthcare professionals using or considering ecotherapy as a mental health treatment, I found it an interesting read. Already aware of the benefits to my own health from regularly spending time outside in natural environments, whether gardening, walking, running or watching wildlife, this book provides clinical examples of patients whose lives have been transformed by ecotherapy. This is Mark Avery‘s story of his passion and long campaign to save the rare hen harrier from the clutches of the driven grouse shooting industry. A passionate birder and superb storyteller, Avery takes you on his campaign trail. Hen harriers feed on red grouse, unaware of estate boundaries and the desire of wealthy hunters to shoot grouse for sport. Hen harrier numbers have fallen to alarming levels, especially in the English uplands. Avery is calling for a ban on driven grouse shooting to save this beautiful bird of prey. This book doesn’t just expose the illegal persecution of the hen harrier, it reveals how government policy is influenced by vested interests. Birds of prey seem to ignite extremes of emotion but whatever people’s feeling, from an ethical stance, wildlife must be protected not persecuted. If you would like to read a more detailed review of Inglorious, you can find it on this blog here. I first came across the David Sheldrick Wildlife Trust and Dame Daphne Sheldrick’s work when researching African elephant poaching for an article I was working on. The DSWT is a conservation organisation with small beginnings that now plays a major role in elephant rescue and rehabilitation in Kenya. When I found out that Daphne Sheldrick had written a memoir, I couldn’t wait to learn more about this amazing woman who has dedicated her life to protecting wildlife. She tells the remarkable story of her devotion to her husband’s legacy and her beloved elephants that has driven her on despite many setbacks. Many of us will never see Kenya’s landscapes and wildlife but reading this book, we get a sense of the scale of Africa’s beauty and the risk of losing its magnificent animals. Update: Just after posting this article, I learned of the very sad news that Dame Daphne Sheldrick had lost her battle with cancer. While living in New Zealand, I had the pleasure of seeing wild animals I had never seen before, including the burrowing nocturnal kiwi, the forest-dwelling yellow-eyed penguin, and the mighty Royal albatross. But it was the flightless kakapo that most enchanted me, though I was never lucky enough to see one. In my quest to learn more, I wrote about the world’s largest and rarest parrot but it was only later that I read conservationist and writer Alison Ballance’s unique insight into their lives. Even if you are never likely to see a kakapo, this charismatic parrot’s survival story is one to read. I’ve always enjoyed watching birds on a novice basis but until I moved to New Zealand, I hadn’t given much thought to bird migration. Living only a short journey from the Manawatu estuary where bar-tailed godwits return every spring, the topic of migration began to fascinate me. These stories of incredible journeys that animals make can help us appreciate nature and value its conservation. In the pursuit of profit at any cost, mega feedlot farms taking over and small-scale cattle ranchers lose their livelihood, and in some cases their life. Although this book reports on U.S. farming, industrial farming is on the rise in the UK and even in “100% Pure” New Zealand. It was this book that led me to read more about the cruelty inflicted on farm animals in the intensive farming industry and eventually to give up eating all animal products. You can read a more detailed review in a past post here. In Sumatra, Indonesia, critically endangered elephants, tigers, rhinoceroses, sun bears, and orangutans are losing habitat as the rainforest is cut down and replaced by palm plantations. Native forests also hold soil in place and retain rainwater, helping to prevent flooding and landslides but monoculture works against nature. Animals face extinction while food manufacturers are making cheap foods with palm oil and farmers are feeding palm kernel to livestock. Chemical producers, drug companies, breeders, farmers, supermarkets, fast food chains and equipment manufacturers are the winners, as well as the governments who support these businesses. The Dead Zone lifts the lid on intensive food production, revealing the dirty secrets of a system out of control. This book is a collection of George Monbiot’s environmental articles written for the Guardian over the years. Together they form a discussion on how we are destroying our environment, either willfully or through ignorance. Unafraid of ruffling feathers, Monbiot shows journalism at its best. When I read The Omnivore’s Dilemma, I didn’t eat meat or fish but still ate eggs and dairy. Although I had made the decision not to eat meat whatever the source, as a writer on nature and sustainability, I was interested to learn more about the benefits of knowing where your meat comes from. Pollan enlightens readers trying to navigate their way through American food choices from unethical fast food to more ethical organic food. Whether you’re a parent, carer, or education professional, Maria Montessori’s early childhood education philosophy could change your view of child development. Rather than seeing children as empty vessels waiting to be filled with adult knowledge, Montessori respects children’s capacity and need to be directors of their own learning, guided but not pushed by adults. Through using the five senses, the child explores and makes sense of their world. Montessori had a significant influence on our children’s early development and helped set them up for lifelong learning. My experience in a Montessori school is one I’ll always remember as life-changing. Vitamin N: The Essential Guide to a Nature-Rich Life is a guide to help people re-connect children with nature. Louv looks at how we can bring nature back into every aspect of our lives, including building nature-friendly houses with natural materials and using renewable energy, gardens with organic fruits and vegetables, camping and taking picnics and woodland walks, star gazing and bird-watching. Louv encourages us to look for nature in our local environment, making it easy to include nature in everyday life. And it isn’t just children who need Vitamin N. When was the last time you rolled down a grassy bank or swished through autumn leaves? Sometimes we just need to be children again and enjoy the simplest of things! Some of these books are on my bookshelf and others I’ve been able to borrow from our county library. Whether you read any from this list or it leads you to read other books on similar topics, I wish you happy reading! Books on my reading wish list! If you’ve read any of these books, I would love to hear what you think. Which books have influenced the way you think and live?